The main purpose of this page is collecting all sorts of 'events' that are Openmoko related in the whole world. Current Events page provides information of both upcoming and past events where Openmoko had or will have a presence. 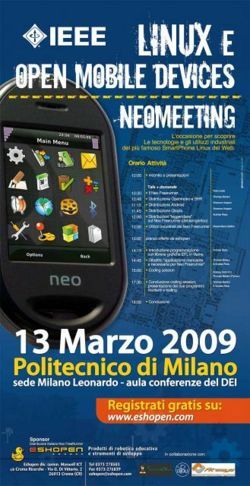 2009-03-02 Programming competition for Openmoko phones|Registration deadline: March 8th, submission deadline: March 24th, 2009 07:00 UTC. 2009-01-01/05-16 Embedded System Design Contest now hold in Taiwan. Openmoko sponsor 10 FreeRunner phones for this contest. And now there are many schools join this contest. 2009-02-27/03-01 FOSSMeet @ NITC 2009 | NIT Calicut, INDIA | Rakshat Hooja of IDA Systems will be speaking about Openmoko and the FreeRunner. 2009-02-12 Openmoko User Meeting in Karlsruhe. The Karlsruhe Openmoko user meet has successfully attracted 12 interested users and we had some inspiring discussion. 2009-02-05 Hackable:1 Openmoko User Meeting in Paris (HOUM#1), Thursday February 5th from 18:30 on. The organizer will prepare a SD card containing the newest pre-installed , updated copy of hackable:1 to each guest coming to this event. the announcement on openmoko-fr (french). 2009-02-08 First FreeRunner Party will hold in Italy at 8 February. Please check luccalug.it to get more information. (only in italian ). 2008-08-23 FrOSCon 2008 August 23-24, 2008 | Bonn / St.Augustin, Germany | Mickey gave a talk. 2008-05-28 LinuxTag 2008 May 27-31, 2008 | Berlin, Germany | LinuxTag | Mickey had a talk, Openmoko had a booth. 2008-05-16 BSDCan May 16-18, 2008 | Ottawa, CA | Ian Darwin presented Openmoko FreeRunner to the BSD crowd.